Instead of giving your grandkids toys, give them an investment in their future. Toys and games come and go, but if you want to give your grandchildren a gift that will last, think long-term and think investments. These presents aren't the trendiest items on shelves, but they are more valuable and will help your grandkids for years to come. If your grandchild is old enough to have earned income, they can invest up to their taxable yearly earnings or $5,500, whichever is lower according to the IRS. The benefit to opening a Roth early is time. A 16 year-old who invests $1,000 yearly in a Roth that generates 7 percent interest will retire with a quarter-million more than someone who invests the same amount starting at age 30. Money stored in a Roth doesn't have to be used for retirement adds Barbara Whelehan, assistant managing editor for Bankrate.com and co-author of the finance eBook, Future Millionaires' Guidebook. "A grandchild could take $10,000 of the funds in the IRA towards a first home if they wanted to," she says. "They can use it for educational expenses and if they didn't dip into it, it could grow really nicely over the course of their lifetime..."
There are some stipulations to setting up the fund, so make sure you know them beforehand. And while grandparents can't set up a Roth for grandchildren, you can help your grandkids set one up, give them cash to invest or match their contributions. For those too young for a Roth, a Coverdell ESA can be used for college tuition, private secondary school or other education expenses. Coverdells allow families to save up to $2,000 a year for students under 18. Coverdell funds grow tax-free, but like IRAs, these accounts are only as profitable as their underlying investments. Mark Kantrowitz, publisher of the college finance sites Finaid.org and Fastweb.com, says for savers who want a wide array of investment options, Coverdells offer greater selection than other education savings vehicles, like 529 plans, but even if you max out the contribution limit every year, it won't be enough to pay for college. "The contribution limits are going to be something that's going to hamper you," he says. Coverdells are available to families with gross adjusted incomes of $220,000 for married couples or $110,000 for single tax filers and funds also must be used for qualified educational expenses or else you'll pay a 10 percent penalty and back taxes on earnings. Unless you're the only one contributing, you'll also need to coordinate with your children to make sure you don't exceed the $2,000 limit. Coverdell funds can be taken out for qualified education expenses at any time, but contributions can't be made after the beneficiary is over 18 and the funds must be used by the time the beneficiary reaches age 30. If paying for college is your goal, 529 plans offer federal, and some times state, tax advantages. 529s come in two forms—prepaid plans which allow grandparents to purchase tuition credits at a rate that's nominally higher than today's prices and trade them in once the child is ready for school, and 529 college savings plans which allow families to select an investment portfolio their account is tied to. Both plans offer tax-free growth, make a minimal dent in the student's financial aid package if the account is held in the child's or child's parents name, and can be used all at once to cover qualified expenses or throughout the student's college tenure. Take 529 money out for a non-education expense and you'll pay a 10 percent penalty on plan earnings and back taxes on the funds. Except for the Private College 529 plan which is designed for students attending private colleges and universities, 529 plans are administered through individual states, though many states only offer one of the two types of plans. You can invest in any state's plan, regardless where you or the beneficiary live, but many states also offer state tax deductions or credits (on top of federal tax incentives) to those who invest in their state's plan. These plans come with high contribution limits—in many states, it's $250,000 to $300,000—and with extra incentives for family members who are looking to unload lots of cash fast. Contributors can give up to $14,000 from a single person or $28,000 from a married couple per year without incurring federal gift tax. 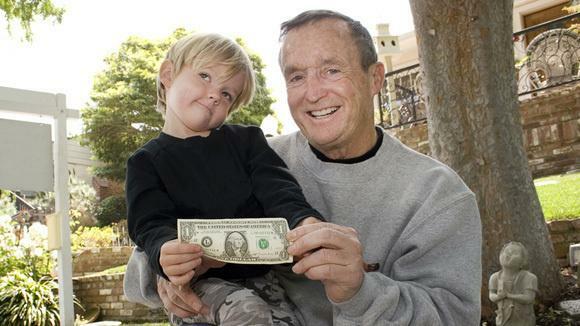 A trust fund can set up your grandchild's fiscal future (and reduce your estate), but it only makes sense if you're moving serious money says John Palley, an estate planning and trust attorney in Sacramento, CA. Trusts allow grandparents to move "just about any asset on Earth" and to stipulate how assets can be used. The drawback is that they're costly. "If you're giving $5,000, then a trust is probably not economical," says Palley, adding that it can cost $1,500 to $5,000 to set up a trust. There are several different types of trusts, Palley adds, and each come with their own set of rules and regulations. Trusts can be set up at any time (the beneficiary does not need to be a certain age) and grandparents setting up the trust have the power to dictate how and when distributions are made. For grandparents gifting $25,000 or more, trusts can provide a way to reduce estate taxes and ensure that your legacy is used appropriately. For smaller gifts, Palley recommends a 529 or UGMA/UTMA account. UGMAs and UTMAs are held in a custodian's name (usually the grandchild's parent) and are tied to underlying investments, meaning that they can gain or lose money depending on the market. One benefit (or drawback depending on how you see it) is that UGMA and UTMA funds don't necessarily need to be used for college. Once the beneficiary is of age, funds can be used for any purpose and these accounts don't have limits on the amount you can contribute, though annual gifts of more than $14,000 from a single person ($28,000 from a married couple) will be subject to federal gift tax of up to 40 percent. UTMAs and UGMAs offer some federal tax advantages. The first $950 of plan earnings are tax-free and for beneficiaries under age 18, the next $951 to $1,900 are taxed at the child's tax rate, which is generally lower than the tax rate for the account holder. Fund earnings about $1,900 are taxed at the account holder's rate. Stocks have the potential to increase in value, but they can also drop. Gifts of stock, bonds or other securities are subject to gift tax regulations, so gifts above $14,000 from a single grandparent or $28,000 from a married one will cost you. Aside from the fee you'll pay to transfer the stock, moving stocks or bonds to a child or grandchild's name won't incur extra taxes until it's time to sell, says John Palley. When the child is ready to sell, they'll have to pay capital gains taxes on the total value of the stock minus the "basis," which is whatever you originally paid. In simplistic terms, if you purchased 50 shares of a stock for $1 each and now shares are worth $10 each, the recipient of those shares will pay capital gains tax of up to 30 percent on $9 per share.